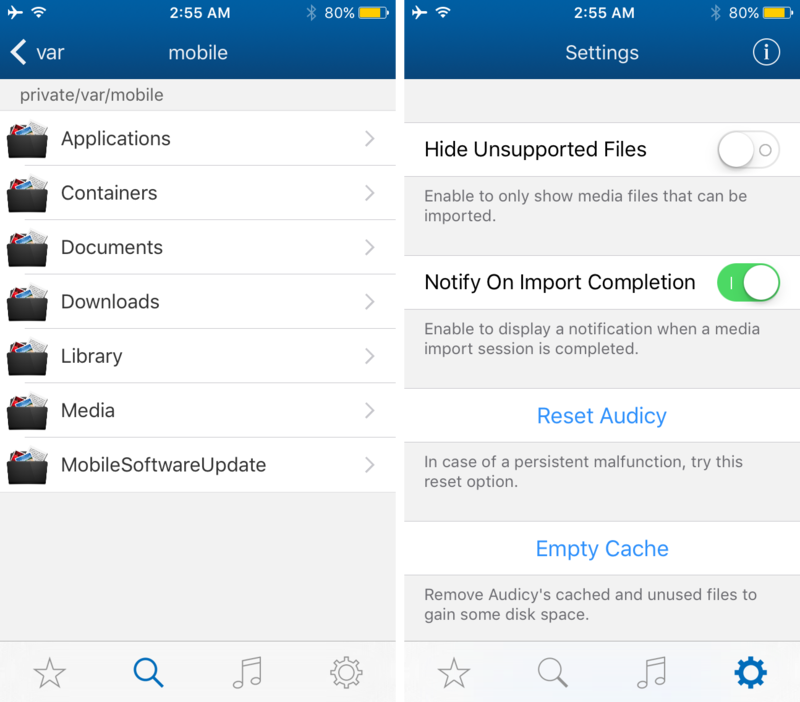 Audicy is a great new jailbreak tweak that lets anyone running a jailbroken installation of iOS 7.0 to 9.1 import media from various sources to their stock media apps. These include the Music, Podcasts, and Videos apps that come pre-installed on your iOS device. In this review, we’ll talk about how Audicy works and show you how it’ll come in handy for quick, on-the-go media importing without having to tether yourself to a computer to use iTunes. The way Audicy works is quite simple. You just need to have some kind of media file that you want to import to your device’s stock media apps, and you’ll just open the file with Audicy to start importing it into the proper app. After you download the tweak from Cydia, you can launch the new app that gets added to the Home screen and you’ll see a number of tabs in the app. Among the most notable are the settings tab and the file browser tab. With the file browser tab, you essentially get to see your file system, just as you would in iFile. Here, you can browse for any media files you might be interested in importing into one of your stock media apps. The Settings tab lets you configure a small number of options, including hiding unsupported file types from being shown, having the tweak notify you when an import completes, resetting Audicy to its factory settings, and emptying the Audicy cache to increase your storage space when you’re done. So we know what you’re probably thinking by now; you want us to start getting into how to import files into the stock media apps on your iOS device. 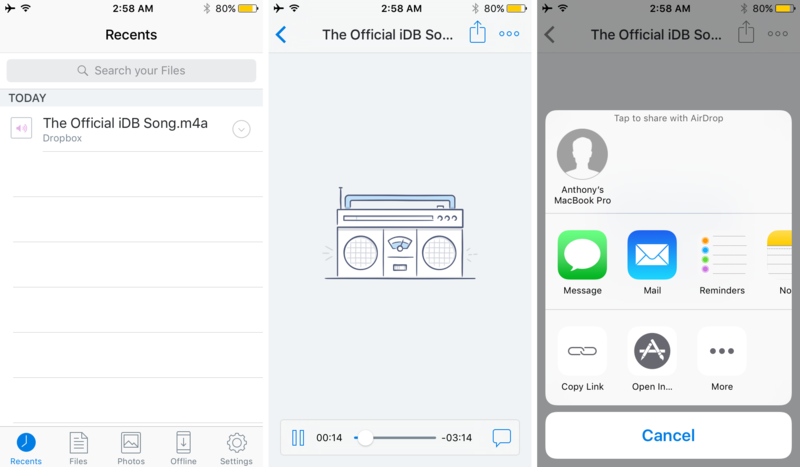 Well you’ve come to the right place, because we just so happen to have the official iDB song sitting in our Dropbox folder specifically for this tutorial. 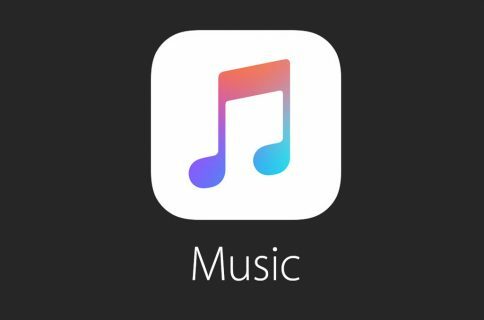 With the import being completed, we can now play the song we just imported from the Music app whenever we want to, and we didn’t even have to use iTunes to put it there. Best of all, it shows all the metadata we configured, so you can pretty much customize anything you import to your iOS device’s media library. 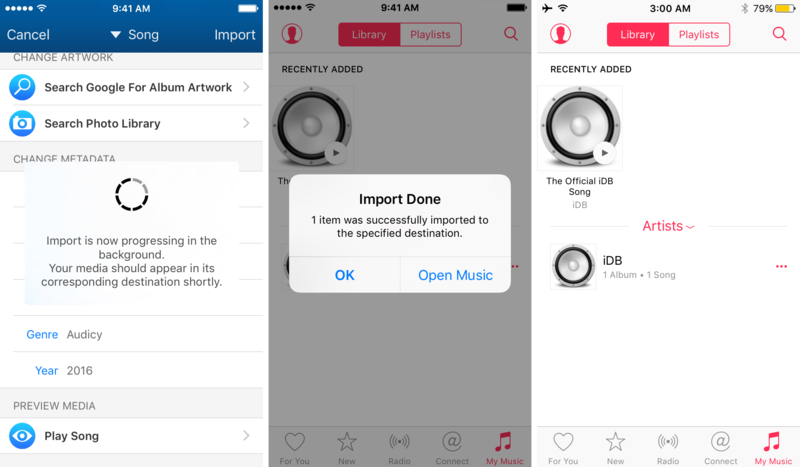 Audicy can import media files from any app that supports them, so long as it supports native iOS share sheets. What this means is that although we used Dropbox in our example, there are various other apps you can import media files to Audicy with; you’ll just have to experiment with them to pick what one you like the most. Do keep in mind that this works for more than just the Music app, including the Videos app and the Podcasts app. 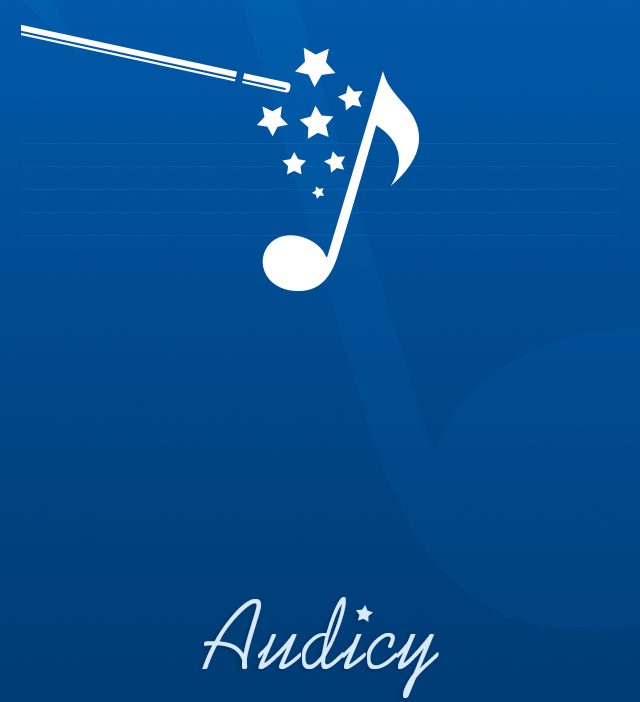 Audicy supports songs, ringtones, music videos, movies, TV episodes, and podcasts. So… have at it. Obviously, you need to respect your copyright laws and not use Audicy as a means to get free media that doesn’t belong to you. But for media files that do belong to you, you can use Audicy to easily import them to the proper app(s). 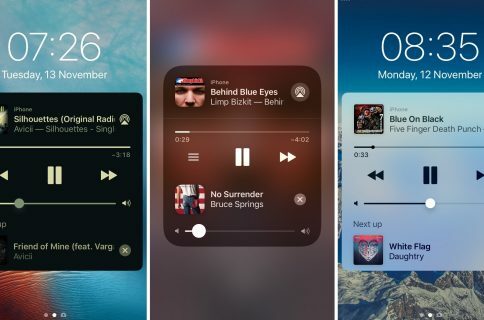 I also feel I should touch on some confusion that the developer says has been surrounding the tweak. This is not a free upgrade from Safari Downloader+ or Chrome Downloader+, but is instead just an importing tweak. Audicy seems to work exactly the same way as many other media-importing tweaks that I’ve used in the past, but it works across multiple iOS versions, which may help sell a lot more people on it. 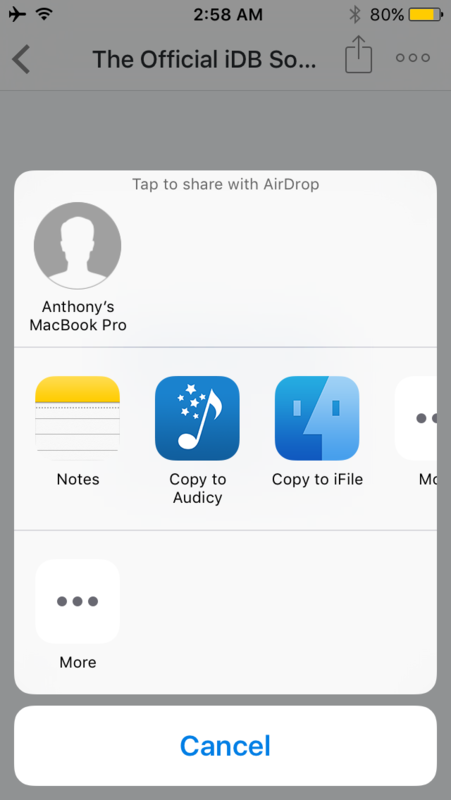 I think that the user interface of Audicy is simple enough to understand, and the fact that it integrates with the iOS share system in order to work with various file-handling apps makes using it very convenient when you don’t want to use iTunes or tether to a computer to import media files to your stock media apps. Being able to edit metadata on the fly before importing the files is not new, but is a notable convenient feature of the tweak, as is the ability to trim files down to smaller sizes. It’s nice to be able to configure your own metadata, and it’s even nicer that the tweak automatically grabs as much as it can from the file before it asks you to enter any. If you’re jailbroken and often use your iOS device for media consumption, then Audicy may be of interest to you. It can be downloaded from Cydia’s BigBoss repository right now for $2.99. 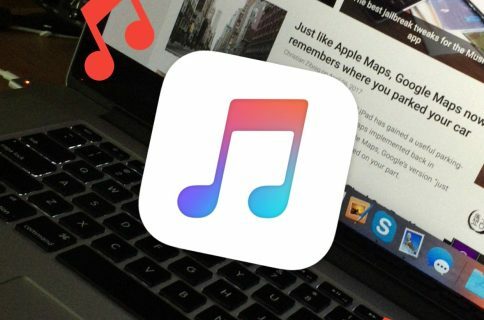 What are your thoughts on being able to import media files to your media library without iTunes? Share below!